This week, we headed towards the nearby town of Manosque. Our destination was Le Cigaloun, in the Old Town part of Manosque. I've never been to the old part of Manosque before, although the LSH has spent some time there, wandering around with his camera, taking some shots. Me, I tend to just drive through the town on the way to the Autoroute or on the way to the supermarket, and have never particularly liked the place. Having seen the Old Town, though, I've been doing Manosque an injustice. It's very quaint and inviting, with lots of narrow winding streets and interesting looking shops. Le Cigaloun is a café located in the main square, with plenty of tables outside for the sunny days, and plenty of trees, too - so essential for shade during the hot summer months. The inside is bright, clean and modern. We settled ourselves at a table for two and looked at the menu. 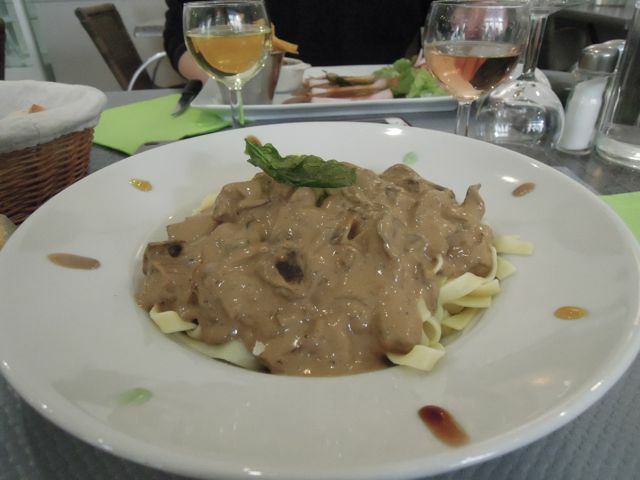 The LSH decided to opt for the Plat du Jour - Rôti de Porc, served with a salad and braised endives (chicory) on the side, while I was tempted by the idea of tagliatelle with cèpes (boletus mushroom). We also ordered a glass of wine each, white for the LSH and rosé for me, which we sipped while we waited. 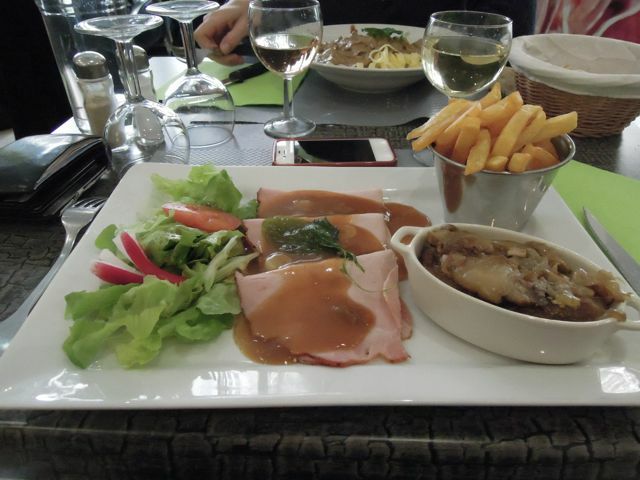 The Rôti de Porc was totally not what we expected - it was more like ham, but served cold, with a strong, garlicky sauce. Lost in translation, or a regional difference? Whatever, it was very tasty, if a little strange to be eating cold meat with a warm sauce. The endive was excellent - I do a variation of this dish, but it's very different, and it's nice to try another version. The salad was good, and the chips (which were extra) were ok.
...well never mind what it looked like, it tasted delicious! I loooove my mushrooms! 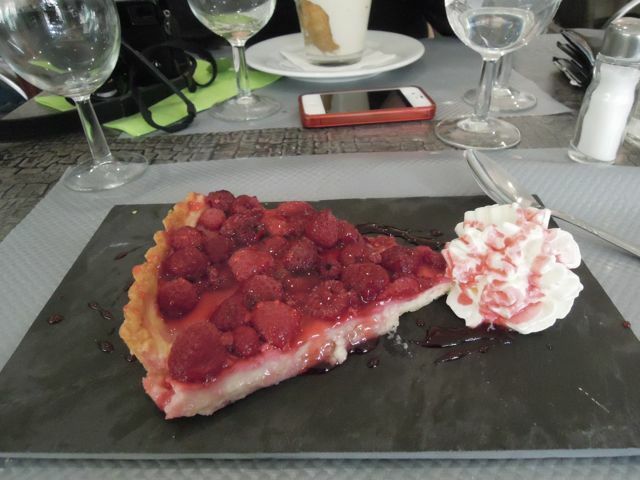 Dessert was next - I ordered Tarte au Framboises (Raspberry Tart) and the LSH ordered Tiramisu. Both were great, they had it all - eye appeal and flavour! Two coffees finished off the meal, and we left just about an hour after we arrived, pleasantly stuffed. The cost for the meal was just under €38, or €19 each - not cheap, but I suppose you pay for the surroundings and the food itself was good. All in all, a very pleasant little café where you can enjoy good food and good service, although it's not one of those places you will walk away from saying "I can't believe it was so cheap!!" It sounds like a tasty meal. I love mushrooms too and would have tried what you had. 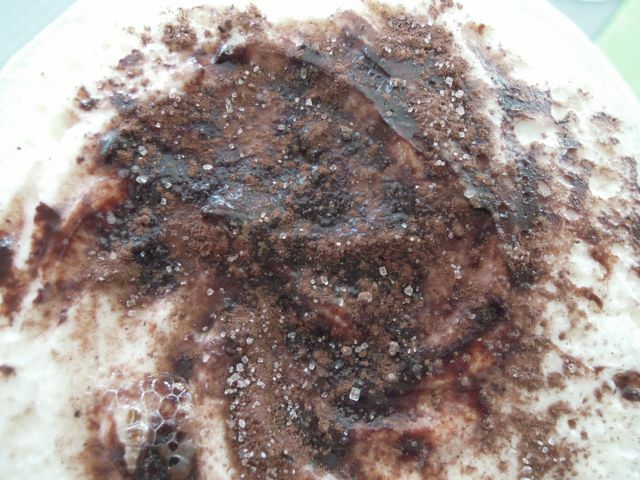 The desserts are always good, I could try them all!. I think there is no way I would try Andouillette it sounds pretty disgusting and the smell would turn me off too. You're smart to stay away from that one.